Red velvet, red velvet, why did you not fail as miserably as your vanilla and chocolate peers? In fact, why did you excel at high-altitude when your vanilla and chocolate counterparts failed? Below are pictures of my first attempts at the Hummingbird Bakery Cookbook's vanilla, chocolate, and red velvet cupcake recipes at high-altitude. That is, these are pictures of control experiments -- I made no alterations to the original recipe because I wanted to see what the unaltered recipes would produce at high-altitudes. Ah yes, the oft-cited puddles of goop. 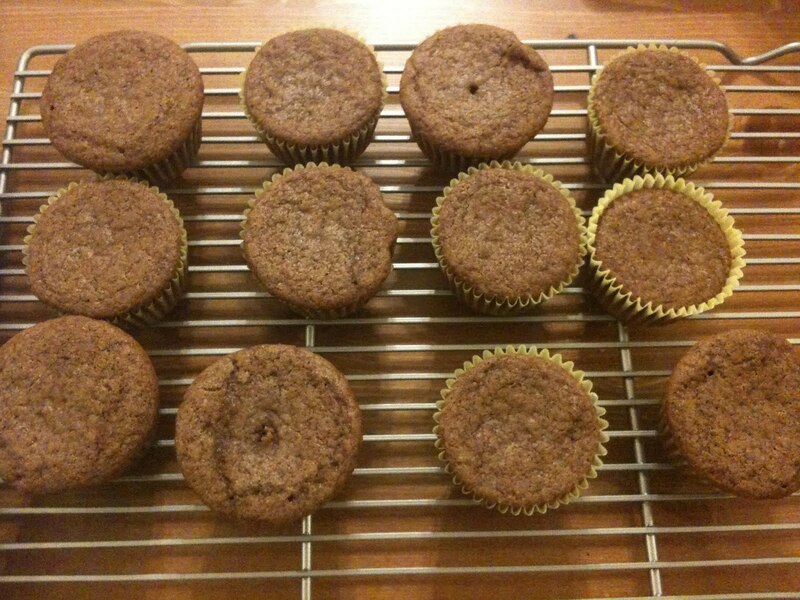 Despite the poor iPhone photo, you can see that these 'cupcakes' are liquidy, overexpanded, and collapsed. Significantly better, but with an undercooked pallor and cratered cupcake tops. Again, pardon the grainy iPhone picture. Deceptively perfect, had it not been for the old sea-level photo I dug out. A little puffy and bloated with ugly cupcake tops, but perfect crumb and flavor. They seem to be getting better and better, no? When I set out to adapt the Hummingbird red velvet recipe, I was incredibly nervous for several reasons. First things first -- not only are red velvet cupcakes my favorite recipe EVER, they also happen to be the Hummingbird Bakery's signature cupcake. According to my British friend Kiron, with the exception of the Hummingbird Bakery, red velvet cake hardly exists anywhere else in England. So pressure was on! I was also nervous because the recipe for red velvet cupcakes contained two ingredients that I had yet to work with at high-altitude: buttermilk and baking soda. According to Joy of Baking (my favorite online source), baking soda is about four times as strong as baking powder. Yerp. A leavening agent that is four times stronger than baking powder? Scary stuff, considering that baking powder has always caused me such pain in my previous experiments. Okay, but wait. Recall that leavening agents tend to work better at high-altitudes due to fact that there's less atmospheric pressure at higher altitudes. This decrease in atmospheric pressure allows the agents to produce more leavening gases, simply because there is less weight (that is, air pressure) pushing down and preventing these gases from forming and rising up. So if leavening agents work extraordinarily well at high altitude, and if baking soda is way stronger than baking powder, why didn't I end up with the puddles of goop like I did with the vanilla cupcakes? In my previous post, I was struggling to define red velvet cake. A baker at Portland, OR's Saint Cupcake Bakery told me that it was a combination of vanilla and chocolate flavors. Now that I've finally taken the time to examine the three recipes, I see that this description was definitely wrong. 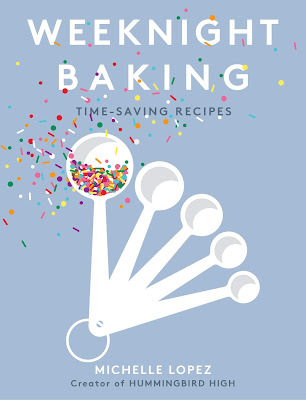 According to the Hummingbird Bakery Cookbook's recipes, vanilla and chocolate flavors are more similar to each other than red velvet is to either flavor. There were the differences I mentioned previously -- red velvet's use of baking soda instead of baking powder and its use of buttermilk instead of whole milk. But looking at the chart above, I see more differences: red velvet cake uses more butter and more flour. The use of more butter is interesting -- according to Susan Purdy's Pie in the Sky: Successful Baking at High-Altitudes, high-altitude bakers are often ill-advised to "reduce the fat in rich cakes and cookies at high elevations." The rationale behind this is that fat (in our case, butter) coats the protein/gluten in flour and weakens it. 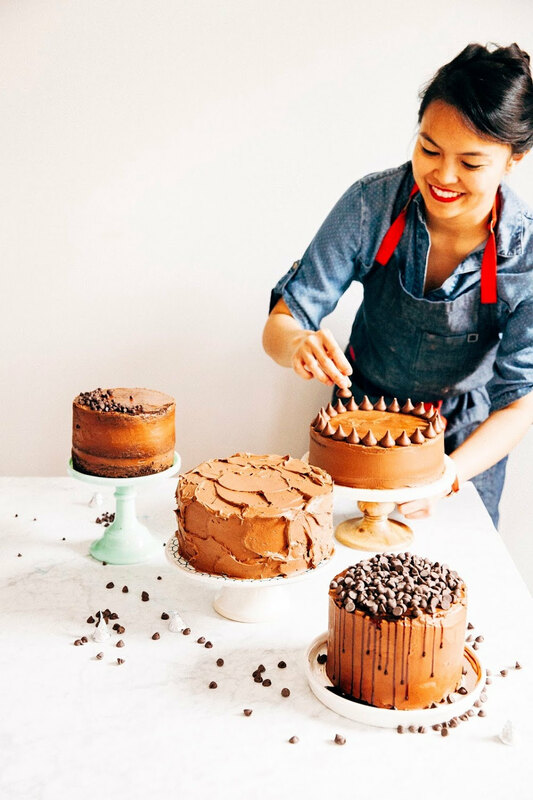 At higher elevations, when liquids evaporate faster, the residual higher concentrations of fat and sugar may weaken the cell walls too much and cause the cake to collapse. However, Purdy suggests an alternative to this reduction -- instead of cutting the fat (which can compromise flavour), you can strengthen the batter by adding flour. Which brings us to the red velvet's high flour content. 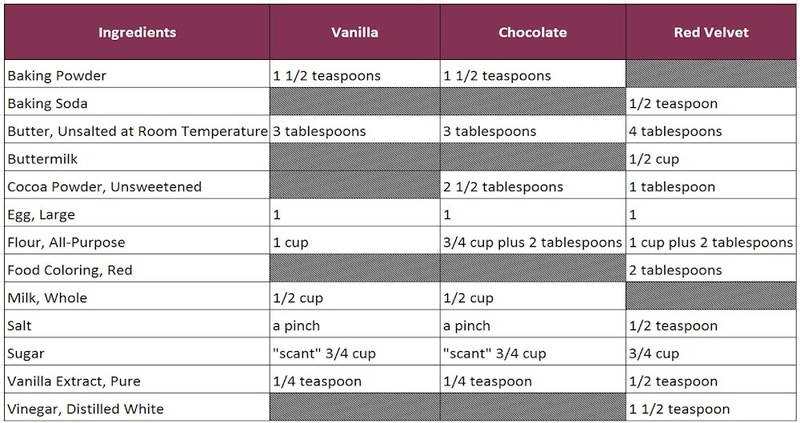 The table above shows that red velvet has the highest flour content of all three recipes above -- that is, red velvet cake batter is heavier than that of vanilla or chocolate. For instance, the vanilla recipe only has 16 tablespoons (1 cup) of flour, while chocolate contains 16.5 tablespoons (3/4 cup plus 2 tablespoons of flour combined with 2.5 tablespoons of cocoa powder). Both recipes are then dwarfed by red velvet, which comes in with 19 tablespoons of some sort of flour mixture (1 cup plus 2 tablespoons combined with 1 tablespoon cocoa powder). No wonder the Hummingbird Bakery vanilla cupcakes recipe only yields 10 while the red velvet recipe yields as much as 14 cupcakes! It is this extra flour that helps add structure to the red velvet cupcakes, preventing it from rising too quickly and collapsing in on itself. Bear in mind that cocoa powder is also a strengthening agent and heavier than flour; while the chocolate cupcake recipe accounts for the addition of cocoa powder by subtracting some flour, the red velvet cupcake recipe does not. Well, well, well. It might not explain why the red velvet cupcake tops are uglier here than they are at sea-level, but it's certainly a start. I have to appreciating your approach of thinking even such a great analysis about science and technology and college papers sometime students get even helpful. These look great. I recently made a red velvet cake with a cooked flour and milk icing. Your decorations look lovely too. Oh, I like cooking. It is always nice to cook something tasty and beautiful. These cupcakes must very tasty. I've written some college papers on this topic.